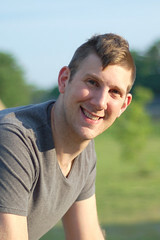 Steve Veno is a chemical engineer specializing in ultra pure water treatment design. He is sci-fi movie enthusiast and can quote scenes and characters from movies spanning decades. He enjoys outdoor activities, including kayaking and traveling. He has two daughters and a son, and four grandchildren. Betsy Waters is a person of many interests and careers. Lately, she has been doing consulting and interim ministry with churches. She has been a school psychologist, a teacher of children and adults, from preschool into graduate school. She loves to travel, do water sports like kayaking and canoeing, play the piano and do puzzle computer games. Two current passions are photography and creative non-fiction writing. I wonder what tomorrow will bring? Betsy has three sons and five grandchildren, including Elijah who visits often. I’ve been interested in cohousing for the past 18 years. I met two of my dear friends through a cohousing group back in the early Nineties and now here I am, sharing the joys of life with my wonderful new friends here at Mosaic. It’s a dream come true: connection, support, safety, privacy, spontaneous social gatherings, lots of interesting conversation, and (of course) great food. I’m here for the long haul and look forward to each day living in community. I love what I do for work; I’ve been a licensed esthetician and makeup artist for the past 24 years, and I work part-time at Trader Joe's. My passions in life are talking with and helping people, and sharing ideas. In my leisure time I enjoy being with my son Brett and all of my family and friends; kayaking, hiking, exploring new places, and being in nature; music, making and viewing art, watching movies, and playing board games and ping-pong; cooking and eating; dogs, dogs and more dogs; napping, learning, holistic health, spirituality, and peace and quiet. Catriona Hughes works as a research archeologist for the Institute for Aegean Prehistory. She graduated from Bryn Mawr College and grew up in Madison, New Jersey. A avid reader, her interests are: the SCA, Kung-Fu, Western martial arts, stained glass, sewing, beading, knitting, book binding, WoW, blogging, gardening, and tree-hugging. Alex Hughes is still defining himself and is busily building neural pathways to express his personality. Hobbies: late night opera. Interests: power cords, spoons, and other people. He is very excited about co-housing. Dave: a Professional Computer Geek. Before Mosaic I lived with Cat and my son Zach, in Natick. 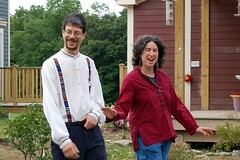 Cat "forced" me to go to the Cohousing Conference at Pioneer Valley in 1999 and I was hooked. My particular hobbies vary depending on the season and my mood. I do a lot of things, and being around other motivated folks really enables me to do the things I enjoy. Everything from doing general work (like building fences, mowing, painting, other woodworking), through supporting all the little projects the community has. For myself, I love playing guitar, bike-riding, skiing, sailing, and taking nice long hikes on our 65 acres of land. INTP. 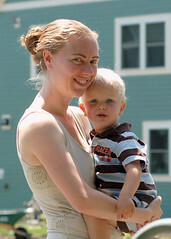 Lucia: I am mostly Stay at Home/homeschooling Mama of four wonderful children. I work part time as a Peer Lactation Counselor and hope to get my IBCLC certification sometime in the future. I am also a professionally trained singer and love music. My other interests include SCA, knitting/crocheting, cooking, sewing and I'm a compulsive only researcher. I found out about Cohousing 6 years ago when I saw an ad for Mosaic Commons and am thrilled to finally move in! Elliott: I'm 7 years old and I love volcanos, spiders, snakes and bats. I have a pet corn snake names Onyx. I have been homeschooled my whole life and I love learning, especially if it's about Volcanos. Did I mention I love Volcanos and I want to be a volcanologist when I grow up? Fiona: I'm an Identical twin and I love my sister. I'm 6 years old. I love rocks, and I have a big rock collection including some really pretty sparkly ones. I also love horses and would like to learn to ride them. I am homeschooled and I'm learning to read. I want to be a geologist when I grow up and I'm scared of volcanos. I also love Disney Princesses and My Little Ponies. Willow: I am 6 and I live with my twin sister and two brothers. I would like to be a Doctor like my uncle one day. I love ballet and dancing. Like my sister I also love princesses and My Little Ponies. I'm homeschooled and my favorite thing to do is draw and paint, but I also love learning to read and tell time. Malcolm: I'm 3 and I love video games, especially legend of Zelda. I sometimes like to be called Link and I have my own foam sword. I love my Big Brother, even though he plays to rough and I love my sisters too. I love letters and reading. I LOVE getting into mischief, so don't let my innocent face and blond curls fool you! I'm looking forward to catching frogs and snakes once we move in. Dwight: I'm proud papa (with Stephanie) to twin boys, Drew and Alex, born in June '02, and I share my life with Sarah F. I'm also a pre-sales engineer for a software company in Newton (which has me traveling about half the time), an amateur radio operator, and a former -- and aspiring -- private pilot. I've had an interest in alternative living situations ever since my college days at the Kent State University Living/Learning Community, part of their Center for Peaceful Change (now the Center for Applied Conflict Management). My biggest hope for cohousing is that its community-building will lead to a more humane existence for us all: a good place in which to raise kids, live life, and grow old. INFP. Sarah: I'm an actuary working for John Hancock. I grew up in Kentucky, but am a happy New England transplant now, living in Mosaic with Dwight, Drew, and Alex. My hobbies are crafts (beading mostly), reading, and creating spreadsheets :-). Someday I also hope to return to playing my violin. Living around other musicians in this community should eventually facilitate that! I went to my first Mosaic Commons meeting in the summer of 2000, and I first learned about cohousing from seeing an announcement about this community, but I have long been interested in intentional community in all its various types. The best part of living in this community is constantly being inspired to better living by learning from my neighbors, and the ability to get out of my house and do fun things without putting forth much effort or time. Drew says "I like to play on my computer, shoot off model rockets (here in our field), and play with my friends. I am interested in all sorts of science, and history, especially pirates. I like to read non-fiction and fiction books about modern fantasy adventure. It's really fun to play here all year around, I have lots of friends here. We have snowball fights in the winter, including Snow Wars. In the summer we play Search and Destroy, a mixture of Tag and Hide and Seek. Some people make leaf collections in the fall. We ride our bikes almost all the time. We have beavers and coyotes nearby, and closer we have peepers, bullfrogs, interesting earthworms, snakes, salamanders, woodpeckers, and hawks. It's convenient to have stores so close by." David says "I am sometimes called Alex. I like playing computer games and playing outside. I like interesting things like shark teeth and swords. I like cartoons, animation, and action (like Pirates of the Caribbean and Journey to the Center of the Earth). I like explosions (like rocket launches), and science with experiments. I have asthma, and I also have nut allergies: peanuts, tree nuts, chick peas, and lentils. I like living in cohousing. It's fun because you get to be around your friends and family. There's great outdoors, so I get to ride my bike whenever I want, because we have so much property that I can just bike around. It's a great place if your parents are divorced because they can move here and you can switch houses whenever you want." 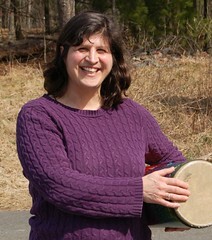 Judy: I am a Clinical Psychologist and have had a private practice at the D'arcy Wellness Clinic in Natick. I also teach part-time at Boston College. I have been married to John for 40 years and we have two children. Alanna is an interior designer and does set design for film, and Shawn is an actor and script writer. They both live in Los Feliz, Los Angeles. When we visit them we stay in the guest apartment of LA Ecovillage cohousing. I currently am expanding my creativity with pottery, and have a small studio in the basement of our home. I also am a Hospital Volunteer Clown and am part of a troupe of wonderful creative people. I am strongly drawn to Buddhist teachings and practice, and I love the written word and read whenever I have a free minute. John and I are runners and like to be physically active. We are currently learning Tai Chi in a nearby town. John and I, and our children, have traveled to the Tibetan part of India with one of our other cohousing friends to work at an orphanage there. It was extremely rewarding and wonderful. On the Myers-Briggs I am an INFJ, so I am prone to big-picture dreaming and get somewhat annoyed by detail. But I can still do it when I must! I have known about cohousing for a long time and have realized the importance of community both to learn about myself and to be of service. Growing older in a multigenerational environment, especially with children around, has been very enriching, and I expect that it will continue to be so. John B.: I've been in New England for 32 years, and am originally from Kentucky. After four years in the military, I received my bachelor's from the University of Kentucky and then my grad degree from Northeastern in Rehab Administration. I spent several years in the non-profit sector working with state schools as well as community mental health organizations. I then moved into the business sector where I have been ever since, working for Fortune 500 companies, and until recently have had my own training/consulting business. Currently I have a job as Sales Program Manager with Cognos. 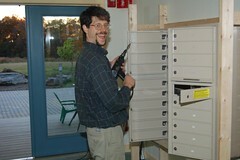 Before Mosaic, I lived with my wife Judy in Natick, MA. Our children, Alanna and Shawn, are out of the household. I heard about cohousing from a couple of sources — first from Judy, then during our summer Family Week workshops at Omega Institute. My biggest hope for cohousing is that I can get involved in a multigenerational living experience. I don't want to spend my later years in life with only people my age. I want the richness of being involved with all ages, including children. The one thing everyone should know about me is that I'm very concrete and specific. My hobbies are exercise, genealogy research, and running (four marathons). I used to make jewelry and would like to get back to that sometime. ESTJ. Bios and pic coming soon! Bio and Pics Coming Soon! Sandy: I'm Sandy Altucher, and before Mosaic I lived in Lancaster, Massachusetts, in a house that was way too big for us. Living with me are my husband Perley, my two sons Alexei, born in 1996, and Mischka, born in 2000, and four cats. I was a software engineer for sixteen years, but left the corporate world in 1998 to take care of my mother, and have not looked back. I now work part-time at the Lancaster library. I first heard of cohousing in 1992, when some friends were trying to start a group in Rhode Island, but I wasn't ready to take the plunge until 2006, when I found out about Mosaic Commons. My hope for cohousing is for my kids to have a pack to hang out with. Ditto for me. 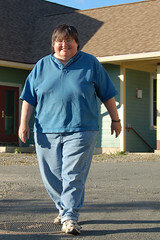 I enjoy cooking, reading, playing Scrabble (and many other games), playing piano, and having interesting conversations. My Myers-Briggs type is INFP. I first heard about cohousing from my wife Sandy when I met her, but wasn't ready to give up what seemed like a lot of control. I've since matured, yay, and gotten a better understanding of the cooperative process in cohousing. I'm also very ready for more community, and I think it will be great for Alexei and Mischka. When we moved into our recently sold home, I swore never to move again, but this time I'm in a community I look forward to growing old in, not just a home to live at. My Myers-Briggs type is somewhere between ENFJ and INTJ. Alexei and Mischka: Coming soon! Ross: I live with my husband Scott, Eris (cat) and Jake (dog). I am a software developer/analyst for a company based out of Portland, ME. I've been doing software and database development for more than 15 years and I enjoy it immensely. I currently work from home and I like having so many friends nearby. I like to read (fantasy, science fiction, romance), hike, play cards and other tabletop games, ride my motorcycle and relax. Before moving to Mosaic I felt very trapped. I worked from home and never really saw another soul other than my housemates. Now I have great neighbors to interact with and a wonderful environment to enjoy. I've been involved with Mosaic since October 2009. Jake: Hi, I'm Jake. I like to walk. I live with my owners Ross & Scott as well as two other annoying creatures that don't like playing with me enough. I like to walk, run, walk in the woods, eat, play with my ball and walk. Oh! I really like walking. In my free time I take long naps on the floor or on the couch. I like Mosaic because there are lots of people here that pet me. I like to walk. San: I'm a trained psycholinguist but did not have a strong interest in teaching, so I left academia for the software world, where I now do analytical quality assurance. Before Mosaic, I lived with Kai, Emma and Pascal, and two cats in Cambridge; I liked being able to walk to work, the library, and stores, but I disliked not knowing my neighbors well and having a tiny garden. I became interested in community during college — I went to two fairly small schools, Simon's Rock (not at the same time as Cat) and Hampshire. I found out about cohousing while living in Amherst, MA, as Pioneer Valley Coho was forming. My biggest hope for cohousing is to have an easier time creating a fulfilling social life for myself and my family members. I've been involved with Mosaic Commons since its pre-beginnings in the fall of 1999. Hobby-wise, I like to garden, knit, cook, and play. I enjoy contra dancing, but rarely make it to dances these days. I love to sing, especially campfire songs and choral pieces, and once upon a time I played piano and guitar. I am hoping that now that we're moved in there will be more time for music in my life. My favorite element is water. PS: San is short for Susanne. Personality: INxx. Kai: I'm a professor of linguistics at MIT. I am very much an introvert (INTP). I thrive teaching my field (formal semantics of natural language) and writing about my scientific research. Before Mosaic, I lived with my family — San, Emma, and Pascal — in Cambridge. I was born and raised in Germany. I came to the US for graduate school (UMass Amherst). I loved living in the city, but cohousing makes suburbia palatable. I found out about cohousing from my wife, San. My biggest hope for cohousing is to build a great place to live. I've been involved since the inception of this group in January 2000. I have spent a lot of time and energy on making our dream a reality. It will happen. In my barely existent spare time, I like running (although I would prefer spending much of that time on playing soccer), doing quite a few more or less geeky things with my computers, watching sports (baseball, basketball, football), cooking, listening to an eclectic mix of music (Elvis Costello, Dusty Springfield, Thelonious Monk, Vinicius Moraes, Beach Boys, 10,000 Maniacs), reading (mystery novels, medieval logic, science in fields not related to my own). Emma has been attending the Sudbury Valley School since the fall of 1999, when she turned 5. Some of her favorite pastimes are doing artwork, playing piano, surfing the web, swimming, and playing soccer. She loves to read and is a huge Harry Potter fan. Animals are important to her, especially dolphins, horses, and guinea pigs. She lives with cats and "they are really sweet". Her biggest hope for cohousing is being able to go out and play with other kids when she wants to. She has been involved with Mosaic Commons since the very first meeting (which was at her house). She would love for other kids her age to join the group. Pascal loves to be fast, whether running around, riding his scooter or bicycle, or swimming. He also enjoys doing artwork and playing board games and card games. 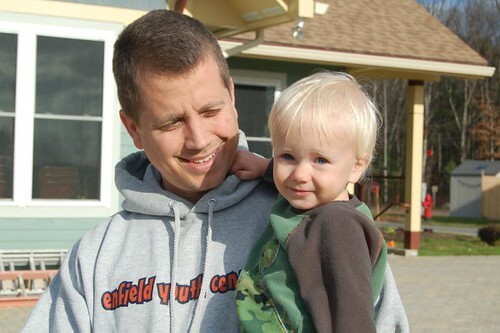 He started Sudbury Valley in the fall of 2003, just before his 5th birthday. Previously, he attended a fabulous cooperative preschool in Cambridge called Totlot. He likes to go to cohousing events to see friends, both young and old. Sophie: I had lived in Somerville for 20 years but had always wanted to live in the country with lots of friendly neighbors. My hobbies are walking in nature, wildlife-watching, singing, playing guitar, acting, clowning, Feng Shui, writing, reading, yoga, gardening, and playing with my cat. I first heard about cohousing in the former Sojourner newspaper, and I thought it sounded cool. Fast-forward to 15 years later; my husband and I decided to go on a cohousing bus tour and we discovered Mosaic. What draws me to Mosaic in particular is that it combines my love of nature, and desire to live adjoining conservation land, with my strong desire for community. Now both nature and community are right outside my door when I want them. Rich K.: I live with my good wife, Sophie. Until making a career shift when we moved, I was a preschool teacher at a Jewish preschool in Cambridge; now I'm a professional woodworker and handyman. My hobbies are woodworking, yoga, model rocketry, bike-riding, and walking. I first heard about cohousing through a co-op house I lived in in Somerville. 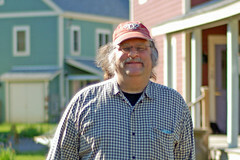 I also wandered by chance into the cohousing association's office in Watertown many years ago and learned more about it. More recently, on a fabulous bus tour with the national cohousing association, we hooked up with Mosaic folks. I'm drawn to Mosaic's consensus process, people's out-of-the-ordinary viewpoints on things, and the group's spirit of sharing and cooperation. My biggest hope is being able to join in the fun with children of all ages, right outside my door. We've been involved with Mosaic since May, 2005. Steph: I am a Social Work Case Manager at Network Health, where I enjoy working with clients directly to advocate for and help add services to their lives. In my free time I enjoy canoeing and kayaking, spending fun time with my twin boys, Drew and Alex, and I've recently renewed my love of my local library. I've known about cohousing for several years and gradually became more interested in it as we got closer to having children. Having grown up in a small community where children were valued and cared for by an entire neighborhood, I would like to make the same thing possible for my children. I've known about this cohousing group almost from its beginning, became involved in August 2000, and became an equity member in March 2001. INFJ. David/Alex says "I am sometimes called Alex. I like playing computer games and playing outside. I like interesting things like shark teeth and swords. I like cartoons, animation, and action (like Pirates of the Caribbean and Journey to the Center of the Earth). I like explosions (like rocket launches), and science with experiments. I have asthma, and I also have nut allergies: peanuts, tree nuts, chick peas, and lentils.